Need a healthy and delicious Weight Watchers side dish recipe that is unique, filling and still low in Points? Well, look no further – this Roasted Cauliflower and Garbanzo Bean Herb Salad Recipe is fantastic. I loved the idea of this healthy vegan recipe, and made just a few changes to make it more Weight Watchers friendly. It turned out perfect, and my husband and I loved it. The bed of fresh herbs was so incredibly flavorful, and was a nice change of pace to standard lettuce or spinach based salads. This Roasted Cauliflower and Garbanzo Bean Herb Salad is an impressive looking salad to serve for dinner parties, and tastes just as divine as it looks. Bright, fragrant, and beautifully flavored, this fresh salad is a real delight. It’s packed with fiber and protein, so it will definitely help you feel satisfied. Makes a wonderful healthy side dish recipe to accompany just about any meal. Preheat oven to 425 degrees, Line a medium sized baking sheet with parchment paper and mist with non-fat cooking spray. Place cauliflower onto baking tray, lightly mist with olive oil mister, and season with lemon zest, salt and pepper. Roast for about 20 minutes, or until the cauliflower is browned and tender. Line a spate small baking sheet with parchment paper and mist with nonfat cooking spray. Place garbanzo beans on the baking sheet, mist lightly with a bit of olive oil, and season with salt and pepper. Roast for about 10-15 minutes or until beans are a crispy golden brown. In a small bowl whisk together olive oil, jalapeño, lime juice and salt and pepper. 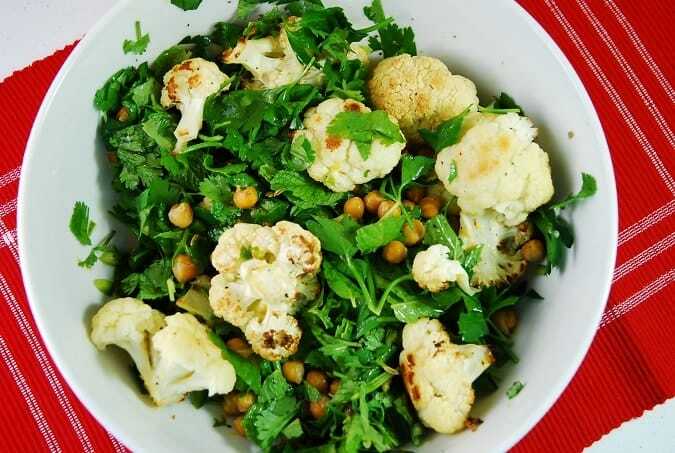 In a large bowl, toss together the fresh herbs, cooked cauliflower and garbanzo beans. Drizzle with jalapeño lime dressing and toss again.